Supplementary material reads: "Gershon. City Desk. Illus. Hawaiian trains. Two shots of combination passenger and baggage car in air being unloaded from Matson freighter Hawaiian Lumberman. Two of Janet Gray, 6, and brother Jimmy 8, Gray, children of Mrs. J.P. Gray of 6516 Via Lorenzo, San Pedro, in cab of engine No 5. Janet tries to ring bell and Jimmy pulls on whistle wire on Engine No 5. 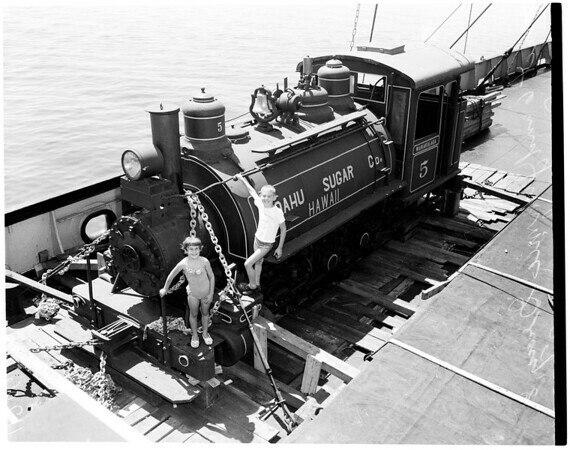 Janet and Jimmy standing on steam boxes of ancient Hawaii trains brought here for Traveltown".